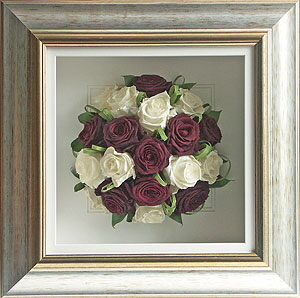 Remember our prices include the preservation and framing of your flowers in a frame of your choice from any of our four frame collections and delivery back to you anywhere in the UK. VAT is also included in our prices. 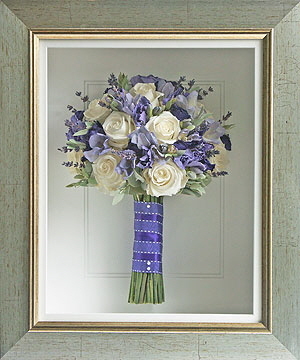 As a general rule, most traditional style and neater type hand tied bouquets usually need to be framed in a 12” x 12” frame if you have the flowers displayed as a birds eye view or in a 12” x 16 frame if you choose the side view display. However, there is a fashion at the moment to have very loose, informal type bouquets with that “just picked” look and these do tend to be larger in size and will almost certainly fall into our large hand tied price band. Just to clarify - a birds eye view simply means the view of the bouquet as if you were looking at the bouquet from above with no stems showing. The side profile means that the flowers will be displayed side on with their stems on show. If you wish, you can also have the groom’s buttonhole, a photograph, wedding invitation, order of service, place cards or other bits of memorabilia from your wedding displayed with the flowers. The prices for these optional extras are listed below. Add £50 for Invitation to allow for increase in frame size.